Moffat County High School girls varsity basketball display No. 2 as the runners-up of the Steamboat Springs Shoot-Out. MCHS girls fell 47-33 against Mead in the final round of the tournament. STEAMBOAT SPRINGS – Moffat County High School basketball teams ran out of steam in the final day of the Steamboat Springs Shoot-Out, but the three-day tournament was not without its positives. 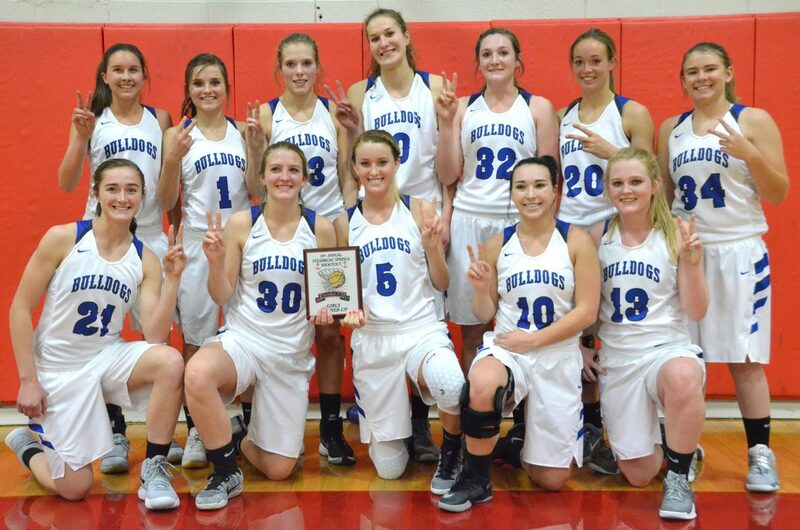 MCHS girls finished second in the Shoot-Out after a 47-33 loss to Longmont’s Mead Mavericks in Saturday’s championship round. Mead, now 5-1, took control quickly with early turnovers by Anna Maher, and though buckets by Kinlie Brennise and Tiffany Hildebrandt helped tie up the score at 6-6, it was the last time the Lady Bulldogs would stay even as the Mavs led 11-8 after one period and 27-15 at halftime. Mead put up eight straight points in the third quarter while their defense didn’t allow Moffat County girls to even got off a shot in the first four minutes of the half until a jumper by Madie Weber slowed their dominance. Going into the final period behind 39-19, Lady Dogs started to turn things around with a seven-point run by Kinlie Brennise and Jana Camilletti, but the gap was too much. Nebeker added that building stamina will be key after seeing players struggle to keep up with Mead’s many fastbreaks. MCHS girls stand at 4-2 after the event, as do Bulldog boys, whose time at the Shoot-Out ended with a 90-63 defeat to Johnson County, whose 3,200-mile round trip saw the Longhorns go 2-1 as they beat out MCHS for fifth place. Kasen Brennise said the final game was especially challenging having little information on the visiting bunch. “They were good, they were solid, they knew what they were doing,” he said. Though Moffat County boys were 1-2 at the event, their win over Eagle Valley snapped an eight-game cold streak at the tourney, where they went 0-3 the past two seasons. Both Bulldog teams will be back in Steamboat this week at all levels. C-Team, JV and varsity will all face off against the Sailors this Friday evening. Steamboat’s varsity girls fell 46-26 to Northridge during the tournament to place eighth at 0-5, while Sailor boys were the runners-up in their home event, capped off with a 67-61 overtime loss to Roosevelt that put them at 3-2 for the season. The game between Yampa Valley rivals will be the final varsity event of 2017, and it’s one boys intend to win, providing all the elements are working on the court. “I think communication will be the big thing,” Kasen Brennise said.